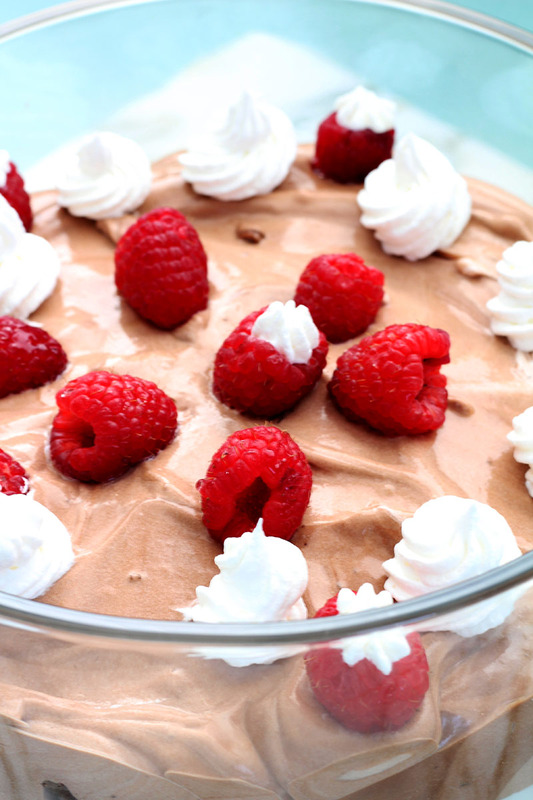 Chocolate Raspberry Trifle is rich and creamy. The french vanilla topping mixed with chocolate pudding are such a treat. Add a box of brownies or use your favorite brownie recipe. If you don’t care for raspberries, you can add strawberries or cherries. This would make a beautiful dessert for Valentines. Don’t you think that this would make a wonderful center piece. You can even tell your family “he who eats all his dinner, gets the biggest bowl.” That is what my sister-in-law always tells everyone. Don’t you love it! You can also use a vanilla pudding and add food coloring to make it any color that you want. You choose whatever you are celebrating. If you do that, you just might want to have some chocolate, strawberry, or butterscotch ice cream topping handy for a little extra flavor on top. And since my daughter and I can’t eat bananas, this is a great substitute! Today is a great day to have a great day! Don’t you just love that saying? 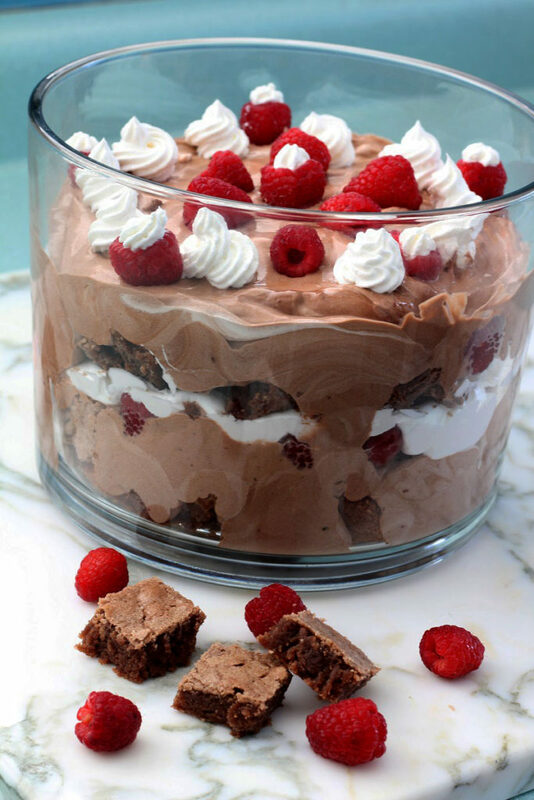 I do know that if you make Chocolate Raspberry Trifle today, it will be a great day. Start by making some rocky road brownies. Just make the brownies only, do not put the marshmallows and frosting on the brownies. After they are made, I cut them into small little squares. These are my favorite brownies, but if you want to you could also use a box mix. I know that the first time that I made these brownies, I was so excited to eat them, however, I didn’t think that they were done and so I just kept baking them and baking them. Pretty soon, I thought that they were done, so I took them out of the oven. Then I put the marshmallows on top of them and left them for about 10 minutes. Well, I must tell you that it was a big FAIL, I had burnt and hard as a rock brownies. Lesson learned, the next time that I made these brownies, I baked them an extra 5 minutes because the regular recipe calls for 25 minutes and my oven takes 30. The brownies came out perfect. Nice and chewy and soft. I am glad that I tried this recipe again, because it makes up very fast and it turns out great every time. I even love to eat them without frosting, and I really like frosting. 1- If you do not care for whipped topping, go ahead and whip a pint of cream, add 1/3 cup sugar and 1 teaspoon vanilla and use it in place of the whipped topping. 2- Use any fruit that you want, such as strawberries, blueberries or even blackberries. 3- This recipe would be very pretty garnished with white or dark chocolate slivers. 4- You may also want to add some chopped pecans. In a mixing bowl add milk and pudding, whisk together until pudding thickens. Then add 1 cup whipped topping into the pudding. Place half of the brownies into the bottom of a glass bowl. Then add ½ of the pudding mix and spread evenly over the brownies then add ½ of the whipped topping and spread, then add 1 cup of the raspberries evenly. Repeat the layers, brownies, pudding, whipped topping and raspberries. Save a few berries and a little whip topping to garnish the top.